Looking for the convenience of a delicious bbq grill anywhere you go? That's right, you can cook up your favorite grilled healthy delights in the comfort of your own home or even camping! We found the best indoor outdoor electric grills that will seriously change up your cooking game, no matter where you are! It's important to make sure your grill surface is large enough so you can feed your family or party. The right material can really make a huge difference when it comes to durability and quality. Look out for surfaces that have non-stick so it saves you the headache of a gnarly clean-up. Some indoor outdoor electric grills will include a stand that makes your grill the perfect height. Also, these are really convenient for tailgating or camping. Temperature control is useful especially if you want to grill certain meats that require adjusting the heat. For those of you who are huge sports fans, there's truly no tailgating party without a delicious barbecue. This is the perfect electric barbecue that you can take anywhere you favorite teams go! 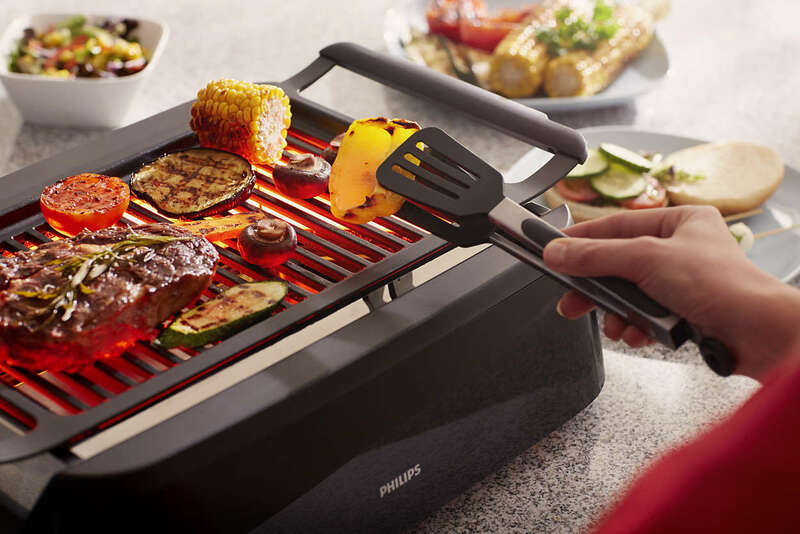 This incredible indoor outdoor electric grill can serve up to 15 servings in one go! That means you, your family, and the party can enjoy delicious grilled meats anywhere! Plus, the grill comes with 5 adjustable heat settings for the perfect cook on your favorite foods. The grill itself is coated with a durable non-stick coating that makes clean up a breeze. Overall, we were extremely pleased with this grill. It's safe to use inside and outside and disassembles really easily. If you travel on the road often and love to cook, this is the grill for you! If you're looking for a slight upgrade from the previous George Foreman grill, you're in for a treat. The GFO3320GM is the big brother to his silver sibling and has extra added features that can really making grilling more fun. With 240 square inches of cooking surface, you can feed up to 15 servings at a time. An added feature is the surface has a more durable ceramic coating making it easier to clean and care for. Plus, the grill comes with a removable stand which is easy for storage. Another bonus is the hood has a temperature gauge, so no more making guesses at internal meat temperatures! Ultimately, if you have a little extra cash to spend and want an upgrade from the silver George Foreman electric indoor outdoor grill, this is your best bet! Living in a metropolitan area with no backyard? Don't fret! This is the perfect grill where you can get delicious outdoor grilling flavors in the comfort of your own kitchen! With a grilling surface fo 180 square inches, this grill is perfect for feeding your family and friends. Also, the grilling surface is made with a non-stick coating and is reversible, which makes cooking different meats and veggies more efficient. Plus, it comes with a removable stand, so you can take your grill camping, tailgating, or even to your local park. The grill cooks between 200-400 degrees, which is perfect for making breakfasts and your favorite grilled meats and veggies. In the end, we know you're going to have a blast using this indoor outdoor electric grill by Cuisinart. Finally, there's a grill that you and your landlord will love! This incredible grill by George Foreman has all the great benefits backed by the quality of its brand name. You're going to absolutely LOVE this grill! Similar to the first two George Foreman grills we reviewed, this excellent indoor outdoor electric grill has 200 square inches of grilling surface, which can feed a family or party. Also, the surface of the grill is a durable ceramic non-stick surface that makes cooking more efficient and clean. In addition, theres a dial that adjusts to five different heat settings in case things get a little to hot. Plus, there's a removable stand, which makes cooking indoors and outdoors a breeze. All in all, you're definitely going to want to check this grill out if you're planning on cooking just for the family or less people. Looking for the perfect indoor outdoor electric grill that acts as a grill/griddle? Magicook has engineered one of the best grills that allows you to cook up delicious griddle treats and grilled meats. With 180 square inches of cooking surface, this allows you to cook your favorite meats and veggies in one go that way everything stays hot when served. Plus, the grilling plate is reversible to a griddle surface. There, you can cooking pancakes, eggs, and bacon for Sunday morning breakfasts. The grill fits on any counter top and is easy to clean. By far, this is one of the most convenient grills to have in your home. We highly suggest it if you're looking for something that's easy to use with your countertop or a picnic table. Want a grill that can cook up breakfast, lunch, and dinner in the comfort of your own home or on the road? This is an awesome grill/griddle which cooks up some of the most delicious foods and is completely portable! The non-stick griddle and grill plate has about 180 square inches of cooking surface, which allows you to cook multiple foods at once. Plus, the hot plate is reversible with one side as a grill and the other as a griddle, saving you time and space when cooking. Plus, it comes with a glass cover which allows you to see your food as it cooks. All in all, this indoor outdoor electric grill will truly up your game whether you're grilling at home or at your favorite camp site. Want a grill that's simple, straight forward, and also can cook indoors and outdoors? Look no further because the Techwood grill is here to save the day! With a whopping 240 square inches of cooking surface, this allows you to cook meats, vegetables, seafood and more all at the same time! No more cold side dishes! Plus, your landlord will love it since it doesn't use propane or any dangerous gases. Simply plug it in a cook up a storm! Also, the grill can be taken on the go as a tailgate grill. All it needs is a 120V plug. 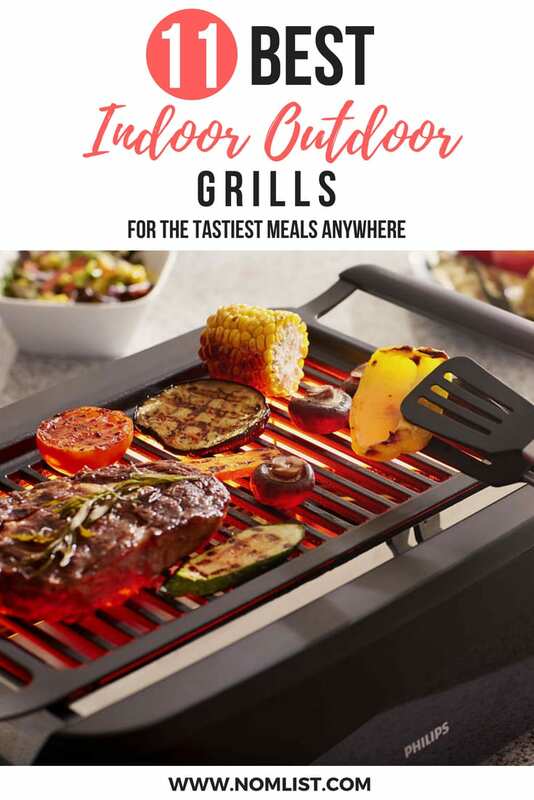 In the end, we know you're going to have a blast cooking up your favorite barbecue foods with this indoor outdoor electric grill. Cook in your kitchen, on the go, in a parking lot, really anywhere! Fans of seafood, rejoice! This is one of the best indoor outdoor electric grills for grilling your favorite fish and shellfish dishes. With a double sided heat source and an auto-power off feature, this allows cooking some trick meats like shrimp, salmon, and lobster super easy! It also has adjustable time settings for different recipes. This grill comes with 100 square inches of grilling surface, which is perfect for a small family or couple. Also the grill comes with an oil drip catch tray, which makes cleaning the grill a breeze. Overall, we believe you will absolutely fall in love with this grill. No matter what the weather is or where you are, you can always count to have delicious seafood and grilled meats anytime, anywhere! That's right, we did not make a typo. Now you can enjoy the delicious tastes of a coal barbecue system anywhere you go! This awesome indoor outdoor grill by Foggo allows you to cook with a handy portable coal grill anywhere you desire. Utilizing a battery operated turbo fan, you can get this grill up and running within five minutes. Plus, it's super easy to assemble and some parts are dishwasher safe. Unlike most charcoal grills, the ventilation system allows you to use less charcoal than the average grill, saving time and money. Also, the grill is completely save since it's double lined and cool to touch. This is truly the ultimate portable grill that will give you delicious charcoal grilled flavors anywhere you go! Need an affordable indoor outdoor electric grill that will get the job done no matter where you are? This Excelvan grill is the best bang for you buck, giving you delicious grilled foods with the power of electricity. With a 150 square inch cooking surface, you can cook up burgers, steaks, vegetables and more for your family. Plus, the light weight and easy assembly making cooking indoors and outdoors seamless. The non-stick surfaces is very easy to clean simply by wiping it clean. Plus, the product is backed with a 12 month warranty giving you extra security. All in all, this is truly the best budget grill that doesn't sacrifice quality for its low price. If you want a high powered indoor outdoor electric grill that will deliver the same power of a standard outdoor grill, you're in for a treat. The CHEFJOY grill is built to last and give you all the tools you need to make delicious barbecue anywhere you go! With a removable stand and a 360 spinning condiments tray, the grill is easy to assemble and use. The stand itself is extremely durable and adjustable in height making it suitable for all people. The temperature regulator is removable making it easy to clean your grill top. Also, there's a grease collecting tray that allows you to cook healthier more flavorful dishes. Overall, we LOVE this grill by CHEFJOY and we highly recommend it for those who really want to up their barbecue game.